For over a year I've been thinking of getting a power meter. Recently I finally made my choice and ordered a CinQo power meter by Quarq (www.quarq.us). Perhaps I'll discover some limitations in the device, but so far... I'm quite happy. My interest in the CinQo started when I learned it would work with the ANT+ Sport wireless protocol. I also liked the fact that it was integrated into the crank leaving me free to change out wheels should I desire. 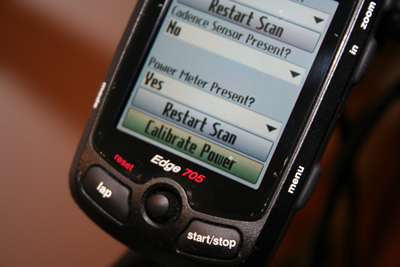 I made contact with Quarq to see if I could beta test their power meter with the new Garmin Edge 705. Things were looking good as Garmin agreed to allow me to use their new computer for the test. I was pretty stoked about being able to be one of the first to review the 705 and the CinQo. 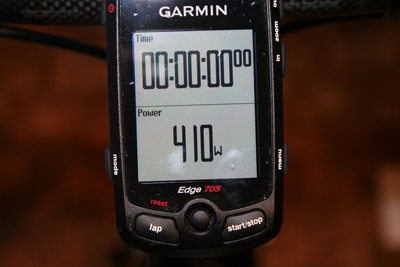 Soon, I had two 705's from Garmin, but no CinQo. 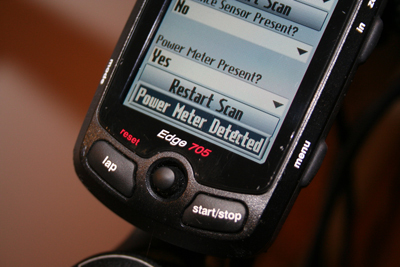 The release of the power meter kept being delayed. Finally, the CinQo was available, but by that time Quarq was not willing to allow me to beta. They offered to allow me to go on the waiting list, but no test for me. Then I learned that the first CinQo's would only work with standard cranks. I had purchased (what I thought would be) a compatible SRAM S900 compact crank. Now nearly a year later, the opportunity came to purchase the standard crank with the CinQo installed directly from Quarq. Frankly, the way the deal worked out, I almost went the PowerTap route. Their ANT+ Sport version is supposed to come out this winter. However, the fact that I would have to purchase a whole new set of wheels kept bringing me back to the CinQo. Why didn't I just get an SRM? $$$$$. 1) Read the directions. 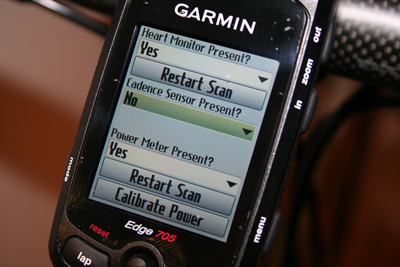 Make sure you upgrade your Garmin to the latest firmware. 2) Pay attention to the illustrations in the manual. Once I had the firmware updated I was ready to get the two devices to talk to each other. 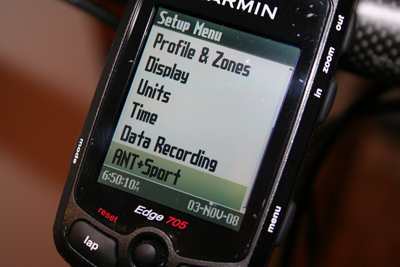 1) Click on "Settings" in your Garmin menu screen. 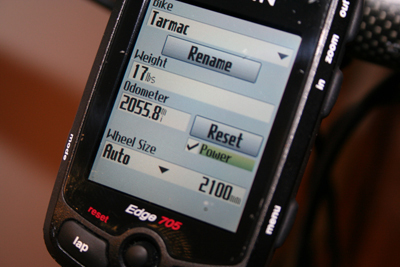 Follow the menu through the "Profile and Zones" to the "Bike Profile" choice. Once there, make sure the "Power" check box is checked. Then go back out to "Settings". 2) Choose the "ANT+Sport" option. 4) Here is where I messed up earlier. I left the "Cadence Sensor Present?" choice as "Yes." This needs to be turned off or you may get some really weird speed readings. 5) Make sure the "Power Meter Present?" choice is "Yes". 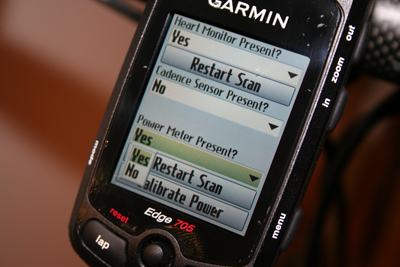 6) Turn the crank backward about five times and then click on the "Restart Scan" button. You should see a message saying "Power meter detected". 7) You can then "Calibrate" the unit by clicking on the button, or you can simply turn the crank backward five times to zero out the unit to the factory calibration. 8) Hop on and ride! You'll see your power come up in the field you designate to show the power. Actually, you could fill the screen with current, average, and max power fields. 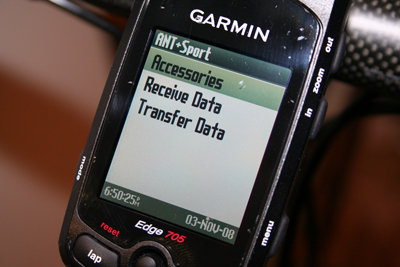 9) Upload your information from the Garmin to your computer. I have a copy of Ascent for Mac and WKO+ for Windows. The data is great for both. 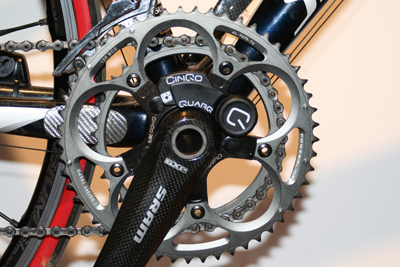 The Quarq CinQo appears to be a pretty solid option for people looking for a lower cost option for measuring power. Time will tell whether it holds up to a full season of cycling. The construction seems solid and I'm looking forward to what it can do. George Hincapie has left another mark on the City of Greenville. Under beautiful blue skies, the Tour de France stage winner and Greenville resident lead dozens of cyclists for a ride along the newly dedicated Hincapie Path. The Hincapie Path is part of the Swamp Rabbit Trail which many hope will someday run from Conestee to Travelers Rest. The section of the trail bearing his name stretches from Woodland Way in Greenville's Cleveland Park to East Faris Road near Greenville First Baptist. Greenville mayor, Knox White, began the event explaining some of the vision for trail. George Hincapie said a few well received words following the unveiling of a trail sign bearing the name "Hincapie Path." The Hincapie family then joined him and city officials to cut the ribbon to officially open the path. Those attending with bikes then had the opportunity to ride the path with George. The ride included a loop through some Greenville streets before returning to Cleveland Park. Following the short ceremonial ride, George headed off on a ride with friends including fellow Columbia rider, Craig Lewis. Many members of the Palmetto Peloton Project's Challenge to Conquer Cancer riders were there to support this great addition to an active Greenville community. These riders recently returned from a week long cycling trip to Austin, Texas to participate in the LiveStrong Challenge. Check out the pictures from The Greenville News at GreenvilleOnline.com.